Brighten up a gray day and stick to your healthy eating goals with this lemony lentil soup from chef Ellie Krieger. There’s no better way to chase away the winter gray or nurse a nagging cold than with a pot of homemade soup. Chicken noodle is always a great go-to remedy, but there are plenty of delicious options beyond Mom’s basic prescription. The recipe for this lemony lentil soup has been in the binder for almost five years, and I always think of it when winter skies start to drag on for too long. It’s a straightforward lentil soup, but a shot of citrus and zest give it a deliciously bright flavor. Plus, it’s packed full of antioxidant rich carrots and kale. The lentils add to the healthy fiber content. 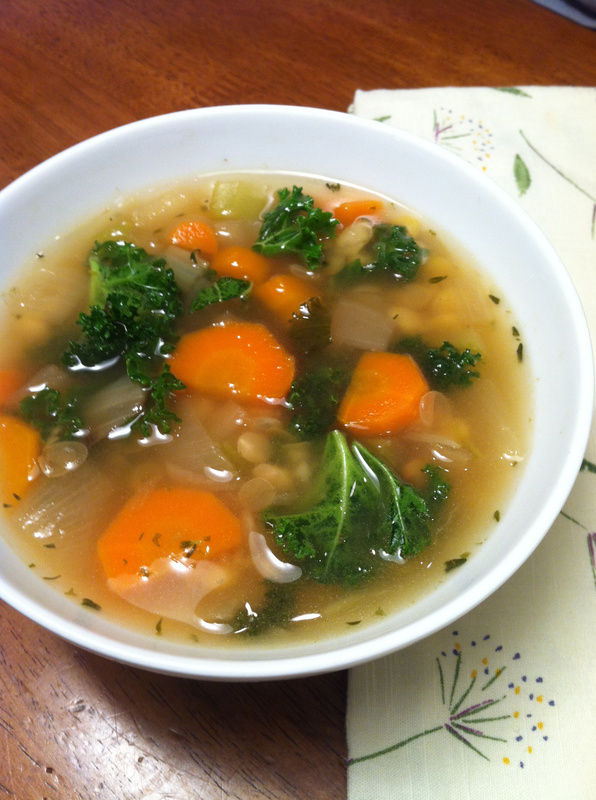 Chicken broth is fine if you’re serving it to hungry omnivores, but substitute vegetable broth to make it vegetarian and vegan friendly. It is gluten free. This recipe comes together quickly. I like to double the onion, carrots and celery for a bigger dose of vegetables. Don’t feel limited to the green lentils simply because that is what is listed. I used Shasta yellow lentils grown by area farmers from Pacific Northwest Farmers Cooperative, but the red, brown or green lentils would work just as well. Find the local lentils in bulk or 2-pound reusable bags at many area grocery stores, such as Super 1, Huckleberry’s, Yokes, Rocket Market and Main Market Co-op. There is a list of all the stores that carry the PNW Specialty Foods lentils on the website davidsoncommodities. com/pnw-coop- specialty-foods. No matter what kinds of lentils are stirred into the pot, the soup is done when they are tender. Heat the oil in a 6-quart pot over medium-high heat. Add the onion and cook, stirring until softened and translucent, 3 to 5 minutes. Add the carrot, celery and garlic and cook covered, stirring occasionally, until the carrots are softened, about 5 minutes. Add 12 cups of the broth, lentils, basil, thyme and salt. Bring to a boil. Reduce the heat to low, add the kale and cook until the lentils are tender, 30 to 35 minutes, adding more broth if necessary. Stir in the lemon juice and zest. Serve.